As featured on KPLU's Christmas Jam, and on KIRO TV, this show is an evening of familiar holiday classics and some lesser know but beautiful songs by Johnny Mathis, Henry Mancini, Burt Bacharach, the Carpenters, Judy Garland, and the Tijuana Brass! Walking In the Air from "The Snowman"
A brand new show featuring Greta and the quartet performing some of Ray Charles' greatest hits, R&B, jazz and ballads. Songs include: Let the Good Times Roll, Just for a Thrill, Hit the Road Jack, Drown in My Own Tears and Sticks and Stones. 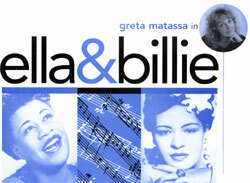 A critically-acclaimed one-woman show highlighting the careers of two of the first ladies of jazz. Featuring many of their greatest hits and biographical information about their lives. Songs include: You'll Have to Swing It, Loverman, Swing Brother Swing, Lady Be Good, and many more! A spontaneous night of jazz standards as only an audience can supply! Each night is different. Audience members are encouraged to shout out their favorite standards, and Greta and the band will field them and make a new interpretation happen on the spot! Only seasoned performers can pull this one off! The music of George Shearing as recorded with Peggy Lee, Nancy Wilson and Dakota Staton. Featuring Susan Pascal on vibraphone. A review of the music of Count Basie and Duke Ellington. Includes classics like Duke's Place, Shorty George, and Shiny Stockings. 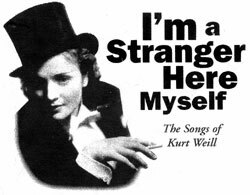 An evening of the cabaret and show music of German composer Kurt Weill. Includes such classics as Speak Low, Surabaya Johnny and Mack the Knife. children's songs done in a jazz style. A beautifully choreographed review of the music of Kurt Weill, performed with the Pacific Northwest Ballet. The music of eight of the greatest jazz singers of the 20th century, choreographed and performed with Spectrum Dance Theatre and the Greta Matassa Sextet. 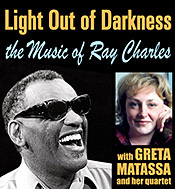 Greta also performs with several Northwest big bands, including Tuxedo Junction, the Bill Ramsey/Milt Kleeb Big Band, and the Seattle Repertory Jazz Orchestra.